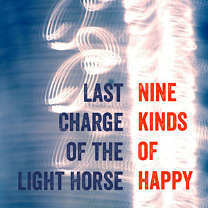 George Graham Reviews Last Charge of the Light Horse's "Nine Kinds of Happy"
For me, one of the thing that has become more difficult to find these days on the music scene in interesting rock. Commercial rock has all become so interchangeable that people have done mash-ups splicing together pieces of pop bands and it all sounds like the same song. The alternative rock scene used to be a haven for musical iconoclasts, but a lot of alternative rock has become as predictable and homogeneous as the commercial side. The roots rockers tend keep it honest but simple. The jam band scene provides an outlet for good musicianship, and there are still some art rock bands around. But there are few groups that I would consider musically creative who work in more or less the context of a rock band with electric guitars and vocals. Last Charge of the Light Horse started out as a kind of one person band, the creative outlet for singer-songwriter Jean-Paul Vest, and had previously released two albums and an EP over the past decade. Vest organized the project in 2004, and released their first album called Getaway Car the next year, and followed that in 2008 with Fractures and an EP called Curve in 2011. Some of the early projects involved Vent in his home studio multiply overdubbing tracks by himself. But the new album features a regular band who add much to Vest’s musically intriguing songs, with their shifting harmonic textures and often atmospheric quality. Setting Vent apart from others in the arty rock school are his lyrics which are intelligent and creative, showing his literate singer-songwriter side. Vocally, Vest has a distinctive sound, not quite the folky. He reminds me of Bill Mallonee of the band Vigilantes of Love who also made highly creative music in the context of a rock band.